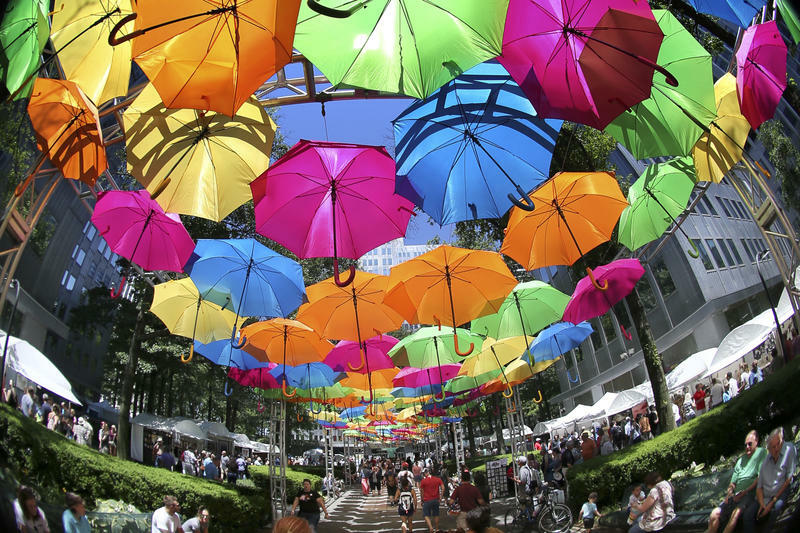 In this image made with a fisheye lens, an array of umbrellas covers a walkway at the annual Three Rivers Arts Festival on Saturday, June 3, 2017, in Pittsburgh. The Dollar Bank Three Rivers Arts Festival is underway all this week in Pittsburgh. The event runs until June 11 and features exhibits throughout Point State Park, the Cultural District and the Gateway Center. From photographers to illustrators to woodworkers, 90.5 WESA is taking a closer look at some of the artists displaying their work this year. Katie Koenig's Paints Pittsburgh "Her Way"
Sitting next to a piece she calls "Hats off to Heinz," Katie Koenig said the city inspires her work. She specializes in acrylic, realistic still-life images, especially"quirky" images of food and drink. Pittsburgh-based artist Katie Koenig stands next to her work, 'Hats off to Heinz,' at the Three Rivers Arts Festival on Monday, June 5, 2017. Koenig said her message to young artists is to not give up. "It's not an easy field," she said. "You're going to have a lot of critics and not everyone's going to love your work. And that's OK, not everyone has to. You have you love your work and love what you do." Koenig's art will be on display until June 8 and can be found online here. Video games and cartoons are the main inspiration for illustrator Emily McGaughey's bold and playful pieces. The Pittsburgh-based artist's work is displayed in the form of posters, shirts, notebooks, stickers, pins and koozies. Emily McGaughey, of Pittsburgh, says she's inspired by video games and cartoons. She'll be at the Three Rivers Arts Festival until June 8. McGaughey said she hopes her art brings joy to its viewers. "I want it to make people happy," McGaughey said. "I use a lot of bright colors and I really enjoy making my work, so I want people to feel as happy as I do when I'm making it." McGaughey's display will be at the arts festival until June 8. Brett Mason’s Beechview home is an obstacle course of display walls and artwork ahead of the Three Rivers Arts Festival. Mason, who grew up two hours north of Pittsburgh, is drawn to capturing landscapes. Most of his work is done en plein air, meaning in the scene he’s painting. The 41-year-old describes his style as a mix between impressionism and realism. Subjects range from an imaginary beach shack to a view of the 10th Street Bridge – all true to life, he said, and based on scenes he often finds running on trails. Mason moved to Pittsburgh in 1999, where he met his wife and bought her a watercolor set. “That kind of got me back into the painting thing and I thought, ‘Wow, this is a different medium,’” he said. Since then, he’s worked with both oil and in watercolor paints. Living the fairly solitary life of an artist, Mason said he welcomes the opportunity to share his work with the public. Brett will be at the festival through Thursday, June 8. Since he was a boy, Bill Snyder has been interested in astronomy. Inspired by pictures he’s seen in magazines, the Connellsville resident decided to start taking pictures of what he saw in the heavens. It was only recently that he thought to share beyond his circle of astronomers. 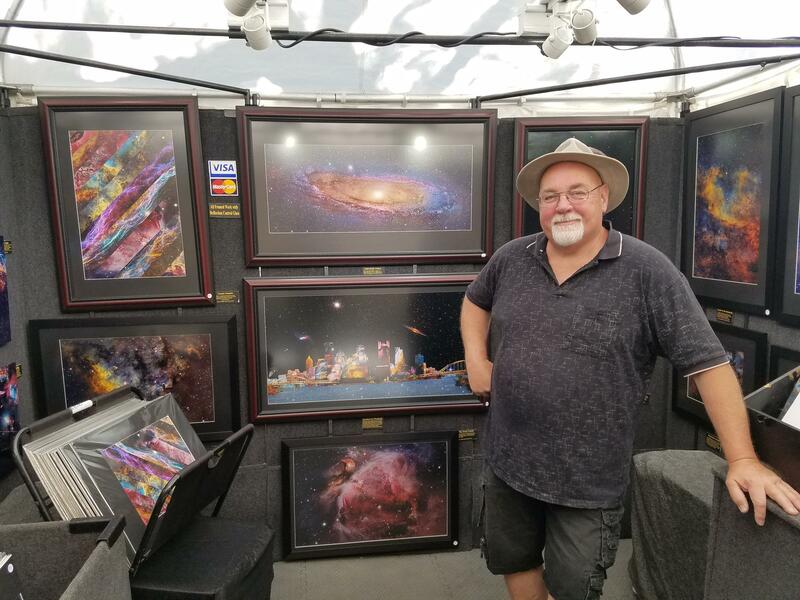 Bill Snyder of Connellsville showcases his astrophotography at the Three Rivers Arts Festival Friday June 2. His images are taken over the course of several hours using his home observatory. He's at the festival through Tuesday, June 6. "Everything was all over the internet,” he said. “About 4 years ago I finally printed some stuff and when I rolled it out on the table to look at it I went, 'well I'd buy that!" The 58-year-old said his pictures are taken over the course of several evenings from a remote telescope in California and from the observatory on top of his house. The images take hours to capture and Snyder uses specially-designed software to combine several nights’ worth of images into prints. “All the images in here are between 15 hours and 40 hours of exposure time,” he said, gesturing to his display. Snyder said he uses narrowband photography, which is a type of photography that isolates certain wavelengths of light and blocks out light pollution. He then layers several images on corresponding color channels to create spectacular views of the night sky. Using online forums, Snyder taught himself the process and shared the results. Four years ago he decided to take his printed work to the arts festival. Since then, Snyder has shown and sold his work up and down the east coast. He’s at the festival through Tuesday, June 6. Greg Stones paints worlds full of whimsical creatures. Around his booth at the Three Rivers Arts Festival hang depictions of zombies, sock puppets and UFOs. Beside his stool, there is a small painting that features a penguin floating in the sky with an umbrella, holding a butterfly net in its flipper. One of Greg Stones' whimsical paintings on display at Three Rivers Arts Fest. Stones uses gauche and watercolor for his materials. The Rhode Island-native was a cartoonist and a photo-realistic painter at Bates College, and he believes these two different methods helped him develop his own style. The purpose of his paintings, he says, is to make people laugh. Stones’ art will be on display until June 8. Vince Ornato is inspired by Pittsburgh’s steel city past, and his booth is filled with images of steel workers and their surroundings. The canvases are covered in vivid colors and workers with proud expressions on their faces. Ornato said the city’s industrial history is often inexorably linked to the heavy pollution, but he shows another side. 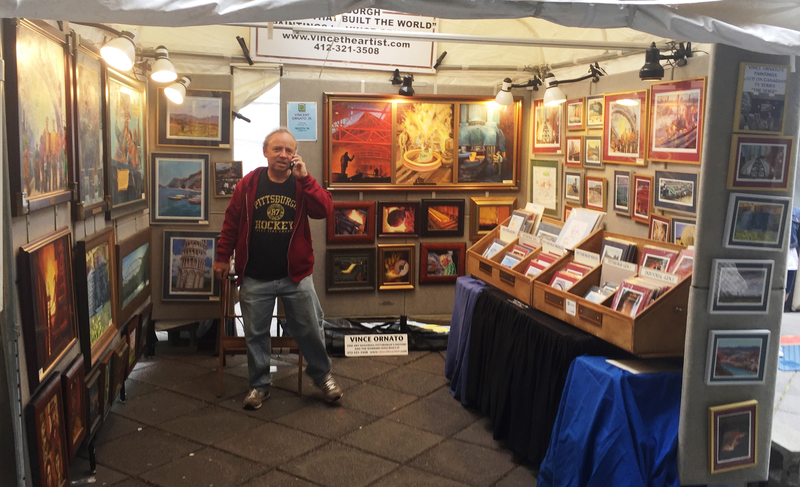 Artist Vince Ornato takes a phone call in his booth at the Three Rivers Arts Festival. Ornato paints scenes from Pittsburgh's industrial past, including blast furnaces and steelworkers. “It eclipses so many great things that this city did for the world and hopefully I can teach a few people here and there that there is more to it than smoky skies,” Ornato said. The subject matter is close to Ornato’s heart. He was as an iron worker, which is how he paid his way through college. While the city’s history is Ornato’s focus, it’s not his limit. He also paints images of Italy and draws caricatures. Ornato will be showing his work behind the Wyndam Hotel at the Art’s Festival through Sunday. Fractals are pretty weird. Their patterns are often spiral or tendril-like structures and repeat themselves endlessly as one zooms in on them. While they tend to have a mind-bending effect on many, artist Dave Schaszberge said they’re the perfect subject for his work. 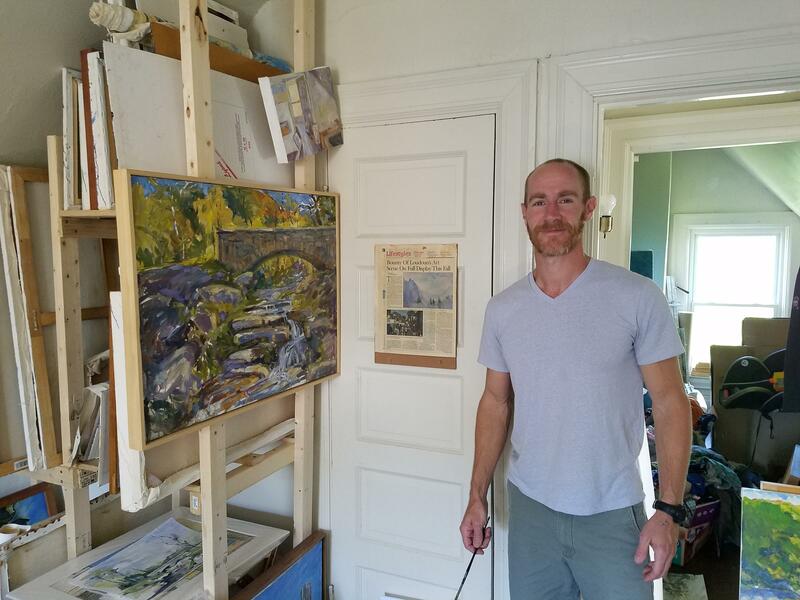 Artist Dave Schaszberger displays his some of his art at his studio in Squirrel Hill. He uses math to create colorful fractal paintings. Schaszberger produces the trance-like images into colored prints by graphing certain equations. He said the way he sees it, the shapes in his work already exist in the equations and he’s just assigning them different hues using special software. Viewers, however, have varying interpretations of his work. Schazberger said this usually has to do with the age of the observer. “Little kids walk by and say ‘Whoa, Mommy, look!’ Older kids through maybe thirty tend to talk about how it’s trippy. Middle-age people seem to tell me about how it relates to whatever religious beliefs they hold. And then older people ask me about copyright issues,” Schazberger said, laughing. His work will be on display at the festival through Sunday. The Cajon is a box-shaped, wooden drum of Peruvian origin that the user typically sits on while he or she plays. Carson Cashman and Louis Maione’s company, Louson Drums, started off creating standard drum sets, but their desire to find a niche led them to their current product: custom made Cajons. Cajon Tabs, developed by Louson Drums, are portable versions of the original Peruvian instrument. Cashman said the instrument was born out of forced improvisation in 18th century Peru. Through their company, Louson Drums, Cashman and Maione have developed a variation of the instrument called the CajonTab. It’s a smaller, more portable version of the box-like Cajon and is especially good for situations requiring many drums, like music classes and drum circles. Louson Drums will be at Point State Park through Sunday. 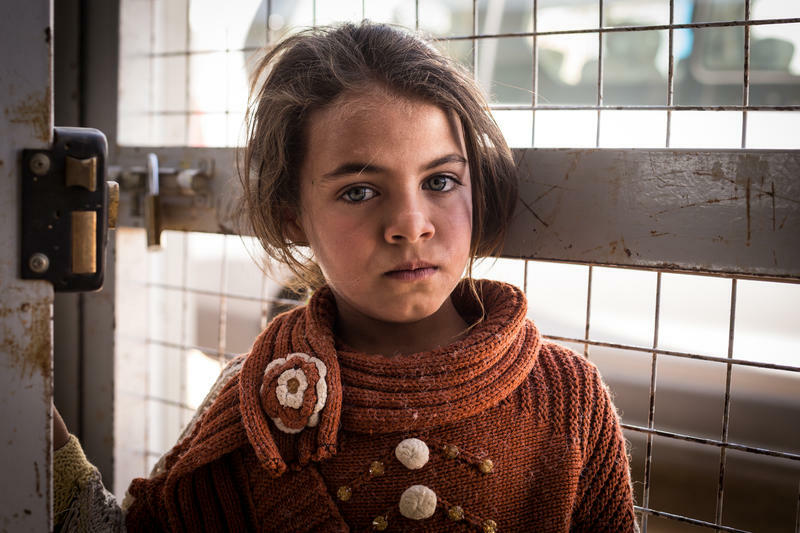 *UPDATED: June 9, 2017 at 3:54 p.m.
For three weeks this past April, Pittsburgh-based photographer Maranie Rae Staab traveled to Zaatari refugee camp in Jordan with Global Outreach Doctors. She documented their work and the people they helped during her time there, calling them some of the most warm and generous individuals she'd ever encountered.